In my last post, I reviewed the content available through the web sites of Canadian broadcasters and concluded that while interesting it was generally not particularly family-friendly. Enter Boxee, a product that hopes to solve this problem by making internet content accessible in a more friendly way on your TV. 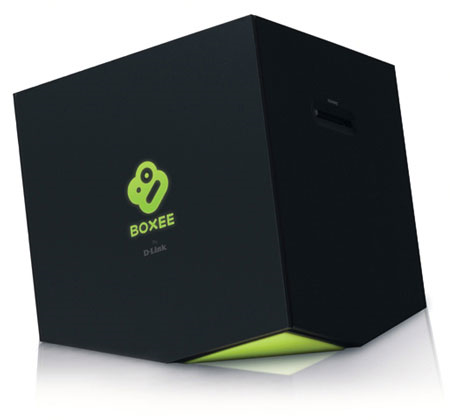 They have recently launched the Boxee Box, which is a small silent little cube that sits beside your TV. You can also run Boxee on your computer, which is what I’ve done for the purposes of this review. The capability list is long, including the ability to play back all of your music, photos, and videos on your TV as well as aggregation of internet content. To get to the internet TV content, you simply use the remote control to click onto the TV Library where you can browse through available TV shows by popularity or hone in on just the new shows. 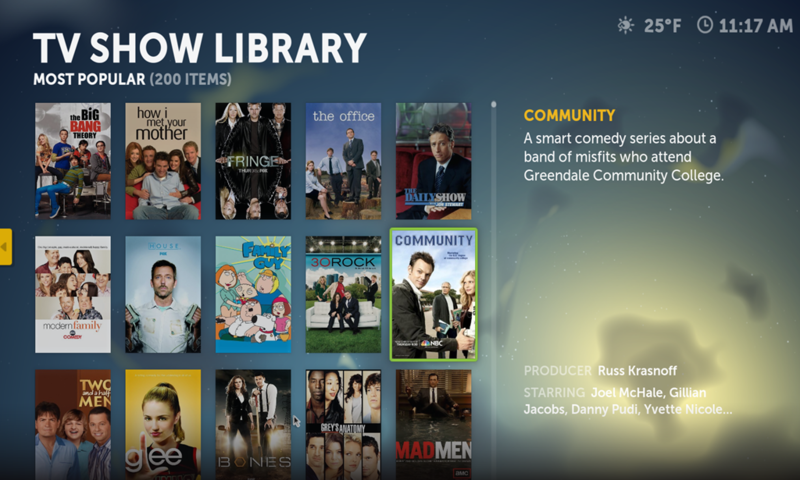 Select a series, pick the episode, Boxee recommends an internet source for the show, click and it starts playing. Brilliant! Once you’ve found a series you’re interested in you can add it to “My Shows” so that new episodes show up for you automagically on the My TV screen. Behind the scenes, Boxee is actually navigating to the broadcaster’s website for you, so you’ll get the same video quality and embedded ads that you would see if you were on their website. Boxee is currently partnered with Global, CBC, CTV, CityTV, Comedy, History, Food, Slice and Showcase as content providers here in Canada. There is a similar experience available for movies, although the content providers available in Canada are pretty limited right now. 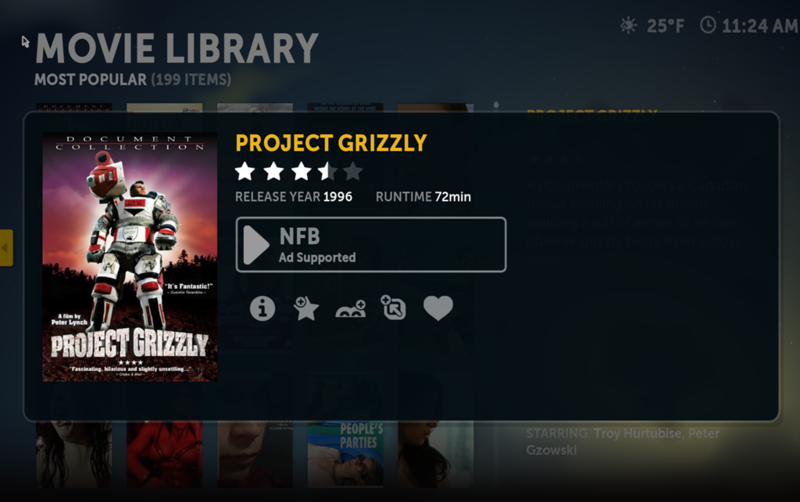 Only films from the National Film Board of Canada are available through Boxee. Just in the last week, Boxee has announced that Netflix Canada is now available through the Boxee Box as well but I haven’t tested that capability. While Boxee is pretty cool, there are some wrinkles that they need to iron out. Because they are essentially clicking the mouse for you across multiple websites, the Boxee team needs to make sure that they’re keeping up with changes that might happen on those sites. Generally it works well, but when a content provider stops working you’re at the mercy of Boxee to update the software. As you can see, Boxee takes the experience of the TV Web Sites and makes it more family-accessible. For my primary requirements, the only one that it doesn’t really meet is the HD quality requirement. Boxee alone isn’t going to meet the ground rules of this review, but I have a feeling that it may just be a major part of a hybrid solution. Are there any high def shows available? We love to watch Fringe and a couple of others that would be sad to see go down to “regular”. Oddly enough, I became familiar with Boxee though my Apple TV. If you own an old silver ATV, then there is a free patch, which modifies the bootstrap of your ATV to include XBMC and Boxee. (BTW, Boxee was built on top of the XBMC initiative and in my opinion, XBMC is much nicer looking and a much nicer GUI) The bootstrap works great as it is easy to install (only an USB stick is needed) and it does not interfere with anything else the ATV does (ie regular functions such as renting movies or buying TV shows). Works are in the way to provide a robust Boxee XBMC solution on the new black ATV and although you can get it working, it is not overly stable yet. Boxee works well if you have your own library of ripped DVDs and/or movies you have downloaded from Torrents and or newsgroups. It has nice ‘scraper’ routines that identified your movies by the filename and downloads nice artwork and metadata for them. Name your movies properly and it works outstanding to find the metadata. As a result, my family has really adopted well to Boxee on the ATV and use it constantly. When the Boxee box came out, I was excited as any other geek to get my hands on it. Several of my friends bought one first and after using it for a few days, all took it back to the store. The verdict was that the hardware is not ready for prime time. Lots of glitches and lots of dropped WiFi connections. It experienced lots of crashes too. It is also expensive. You are paying $200 for a single purpose appliance. It runs on the Atom processor, and for $300 you can buy a nice Atom processor computer (which can easily run Boxee amongst other things). It is probably much more stable too. (http://www.tigerdirect.ca/applications/SearchTools/item-details.asp?EdpNo=5406482&CatId=2627). However even running Boxee for current TV shows/movies, I completely agree with Peter. The Canadian content is very limited and the links to it are best described as flakey. Even on the ATV my family never ventures beyond downloaded content or ripped DVDs. Trying to watch a broadcaster’s content is a) hit and miss, and b) poor quality when hit. How did you get the Canadian Content? I installed Boxee last night and couldn’t find any way to get Canadian stuff. Pls help. You forgot to list satellite TV as an option. With a 33 or a 36 inch dish and an HD FTA satellite receiver, you can receive about 80 English channels with 8 of those in HD on Ku Band. If you have room for a bigger dish, you can get even more with 220 English channels and 36 in HD on C band as well. These FTA channels are unencrypted so they are legally available for free with no monthly subscription. The larger dish also allows you to subscribe to HITS TV which offers up to 82 US speciality channels, easily filling the gap left over from cutting the cable. The nice thing about HITS TV is that there are no contracts and you only have to pay for the channels you want to watch (i.e. No basic package required). Programming is prepaid either 1 month, 3 months, 6 months or 12 months in advance. Several channels are also available a la carte which allows you to create your own custom package. This service is legal in Canada as US subscription from a large dish service is not illegal under Canadian law. I am so happy to have Boxee to avoid all the Canadian content crap that is forced on me in this country. Great to find all the amazing American programs that we are blocked from seeing, or see so many years later. I gave the Windows Boxee software a try, latest version 1.5 and wasn’t too pleased with the bugginess of it all 😦 especially for Canadian content, and furthermore I learned that Boxee 1.5 would be the last version for PC’s since they’re now leaving the HTPC market in favor of the Boxee Box by D-Link device. 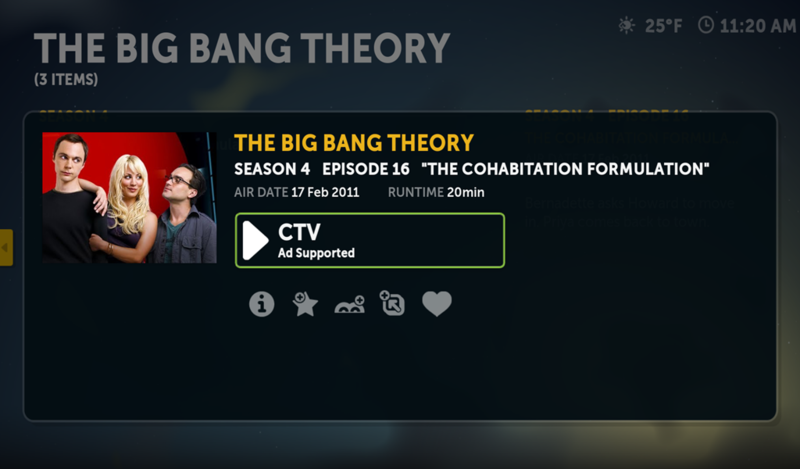 I’ve since moved on to XBMC (Eden) and added in The Canada On Demand plugin brings over 30 Canadian television stations directly to your HTPC. 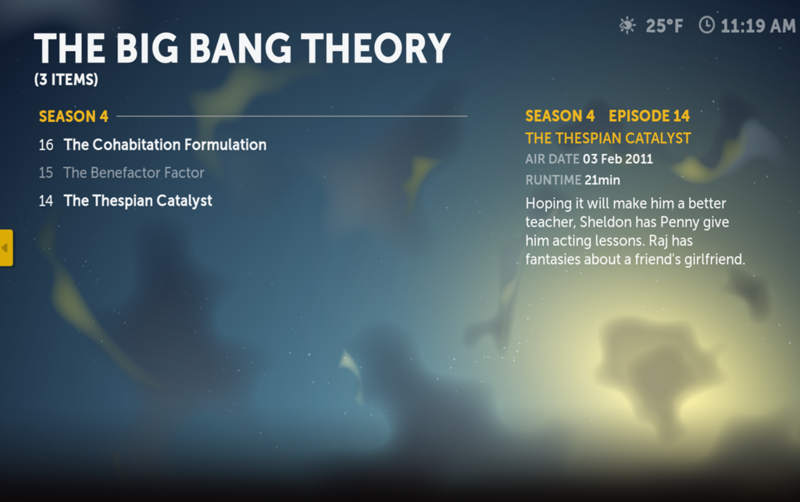 Available through the XBMC unofficial add-on’s repository. This solution has so far worked out remarkably well. Truthfully, I’ve a PS3 and im getting an XBOX.